Advertising telecom offers is a challenging task, and even more so for innovative solutions : finding the right message to convince potential customers is tricky, especially since market maturity greatly impacts how well they understand the benefits of a given technology. Which benefits of a broadband offer should be put forward (time saved, instantaneity, application multiplicity, entertainment…) ? What kind of visuals should be used (indoor / outdoor places, characters, devices…) ? Should analogies be included to highlight a specific feature of the product ? 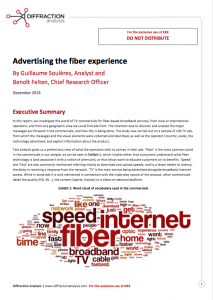 Does advertising Gigabit products imply a different strategy ? These are some of the questions operators will face while developing their advertising strategy. With an analysis based on the visuals, messages, and information of 130 TV commercials created by operators from all around the world, this report provides answers to these questions. These characteristics have been collected and crossed with additional data (technology, market maturity, speed of the offer, geographic area…) to identify trends and recommendations. The report includes direct links to over 115 commercials . The texts from the commercials were transcribed, and translated when necessary, and are also shipped with the report. 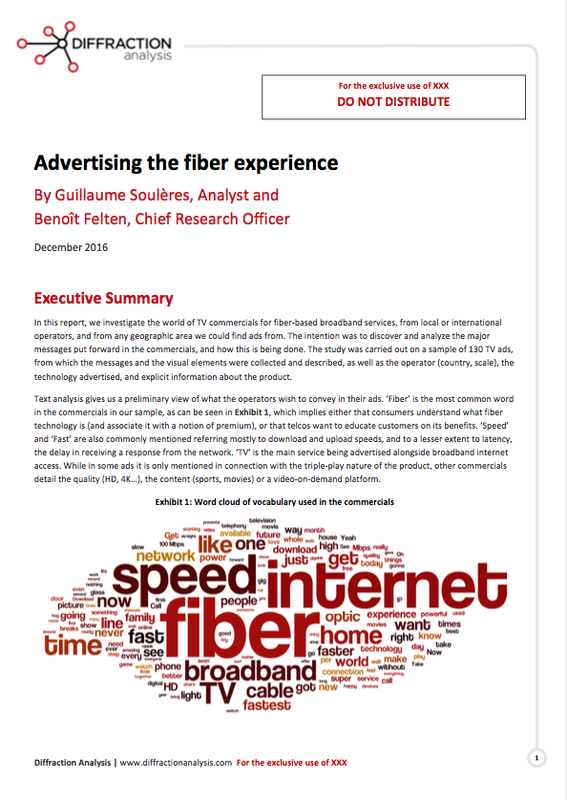 This report is a must read for broadband providers entering the fiber landscape or launching new offers such as Gigabit services, as well as for operators who seek new ways of reaching potential customers in an evolving market. The report is available for direct purchase via Paypal (with any authorized credit card) or you can contact us for a more traditional payment method.